Build your very own digital camera with the Bigshot camera kit. It's a no-solder clip-together kit to help anyone understand the electronic and mechanical systems required to build a digital camera. The enormous appeal of the camera can be used to turn it into a compelling tool for learning. We believe that a camera designed for education must have three features. First, it should be designed as a kit for assembly – putting the kit together should expose the user to a wide range of science concepts. Second, it should include features that cannot be found in other cameras, allowing the user to explore new creative dimensions. Finally, it should be low-cost, making it accessible to the less privileged. Bigshot has been designed with these goals in mind. 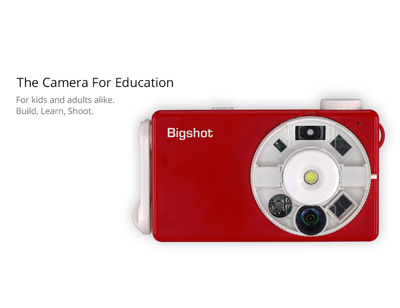 There is another important feature that sets Bigshot apart from virtually all educational kits – once you have built it, it is a fully functioning digital camera that you can use everyday! Bigshot offers you three distinct experiences. (a) Learn: While assembling it you can use the descriptions, illustrations and demonstrations on this website to learn fundamental concepts in optics, mechanics, electromagnetism, electronics and image processing. (b) Create: Once assembled, use Bigshot to tap into your creative potential as a photographer. You can compose and capture moments from your everyday life, while experimenting with framing, lighting and motion. (c) Express: You can share your favorite photos and related stories with others in different communities or even different countries. We believe that the sharing of life experiences through photos, across geographical and cultural boundaries, is a powerful way to open the minds of kids (and adults) who may not have the resources to travel the world. A major goal of the Bigshot project is to exploit the engaging nature of cameras to draw young minds to science and engineering. In doing so, we are particularly interested in targeting children in under-served communities (see Bigshots for Good). However, Bigshot has been designed to reach a very wide audience. It is a great project for a parent to work on with their child. For elementary and middle school students, a teacher may pick bits and pieces from our Learn section and add their own (grade appropriate) lessons to develop a course or an after-school program. An adult who is fascinated by cameras but is not aware of all its inner workings may find answers to some of their questions. We hope you too will enjoy the Bigshot experience!